In the previous post we have discussed about bituminous curing compounds. 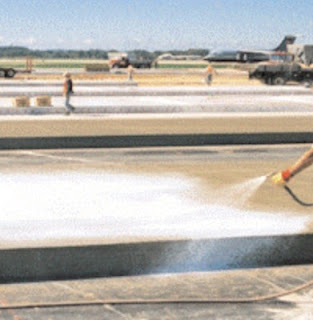 In this post we will learn chemical compounds that are used to form concrete curing membrane. The membrane that is formed by chemicals will be discussed in this post. The sheet membrane curing techniques will be published in next post. The specifications of liquid curing compounds are found in ASTM C309-93 and ASTM C171-932 provides specifications for sheet membrane. The curing compounds are sprayed over concrete surface. The chemical compounds that are very common in use is hydrocarbon resin dissolved in high volatile solvents. Sometimes to avoid unsprayed area fugitive dye of bright color is used with this resin solution. To avoid temperature increment due to solar heat absorption, white pigment or aluminum pigments can be included with this solution. Another resin solution containing acrylic, styrene or vinyl butadiene and also chlorinated rubber are available in the market. Hydrocarbon resins have some desirable features like it develop a poor adhesion with concrete facilitates easy removal and degradation due to exposure to ultraviolet light is also observed. Once wax emulsions were used as curing compounds. But the emulsions produce a slippery finish that cannot be removed easily. Now these compounds are not used or have a few uses. Excellent use of the curable chemical in concrete for satisfactory job provided by curing compound in India has been expand here to increase the benefits in commercial organization. Thanks for giving this ridiculous blog.